Some miscellaneous photos of the Tumpat district. 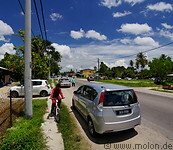 The local population consists of Malays, ethnic Thais and Chinese. In the Tumpat district rice is intensively grown, with plenty of rice paddies everywhere.